(Click to enlarge) Dr. Marcus Noland devles into the economics behind developing policy toward North Korea at the East-West Center in Washington. WASHINGTON, DC (July 26, 2011) -- Nowhere is the efficacy of economic inducements and sanctions more hotly contested than on the Korean peninsula. Assessments are sharply divided. Critics of engagement argue that positive inducements are fraught with moral hazard and the risk of blackmail, encouraging the very behavior they are designed to forestall, while proponents regard it as a strategy that has never consistently been put to the test. In this presentation, Dr. Marcus Noland discussed his recently-released book, Engaging North Korea: The Role of Economic Statecraft, and examined the efficacy of economic statecraft vis-à-vis North Korea. Both the use of sanctions and inducements to achieve nonproliferation and wider foreign policy objectives on the Korean peninsula were equally ineffective in achieving the desired goals, argued Dr. Noland. The three main contributing factors to this lack of success were outlined by the speaker as 1) a shifting set of North Korean government interests over time 2) the lack of international coordination in such policies and 3) the tendency for authoritarian regimes to be less affected by sanctions and less willing to engage after sanctions are put into place. Additionally, inducements have not been successful due to the North Korean government’s ability to reap benefits while largely limiting the impact of such policies. Contrary to what many believe, Dr. Noland explained that the North Korean regime does change over time. While the political economy is fueled by militarization, regime survival takes precedence. Furthermore, in times of economic distress Pyeongyang does not moderate its behavior - take for example the sinking of the South Korean corvette the Cheonan and the shelling of Yeonpyeong Island. Thus, Noland argues that North Korea’s behavior changes with relation to changes in Party interests. There is also a lack of international coordination with regards to economic engagement efforts. Not only are international and regional powers unable to agree on definitions of banned goods (ex. luxury items), Pyongyang engages mainly with governments that are not interested in using sanctions against North Korea. Additionally, China, its largest trade partner, has no interest in using sanctions against the regime. Dr. Noland believes that international community needs to better address and respond to such behavior. 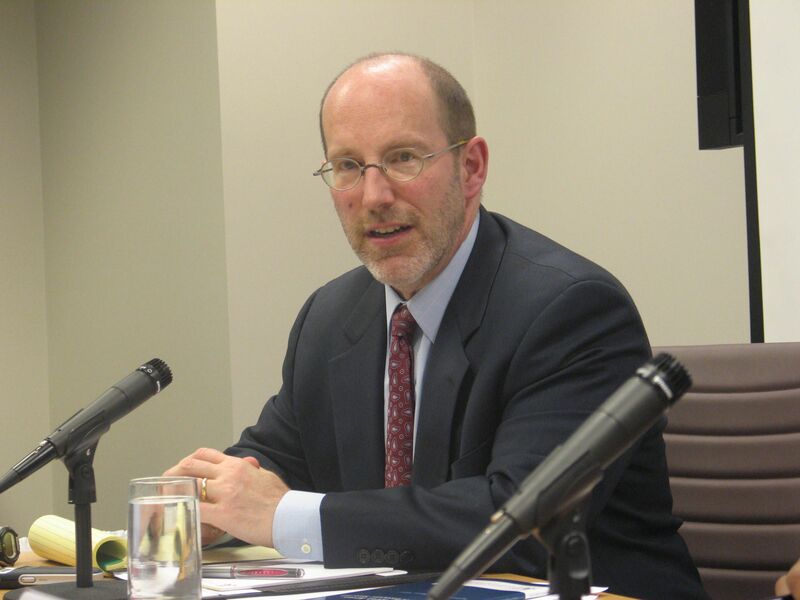 Marcus Noland is a non-resident senior fellow with the East-West Center and is deputy director and senior fellow at the Peterson Institute for International Economics. Previously, Dr. Noland was a senior economist at the Council of Economic Advisers in the Executive Office of the President, and has held research or teaching positions at Yale University, the Johns Hopkins University, the University of Southern California, and Tokyo University, among many other institutions. His work encompasses a wide range of topics, including the political economy of US trade policy and US economic relations with Asia. He has written extensively on Northeast Asian economies, and is unique among American economists in having devoted serious scholarly effort to the problems of North Korea and the prospects for Korean unification. Dr. Noland has authored, co-authored, or edited numerous books, including Avoiding the Apocalypse: the Future of the Two Koreas, which won the prestigious Ohira Memorial Prize. His latest work is the Policy Studies Series monograph Engaging North Korea: The Role of Economic Statecraft, co-authored with Stephen Haggard. Dr. Noland received his PhD from the Johns Hopkins University.